Communities in Bloom is a Canadian non-profit program committed to fostering civic pride, environmental responsibility, and beautification through community involvement, with a focus on enhancing green spaces in communities. Last July, judges from the BC Communities in Bloom program visited Bowen Island to evaluate the community based on criteria such as environmental action, tidiness, landscape and floral displays. 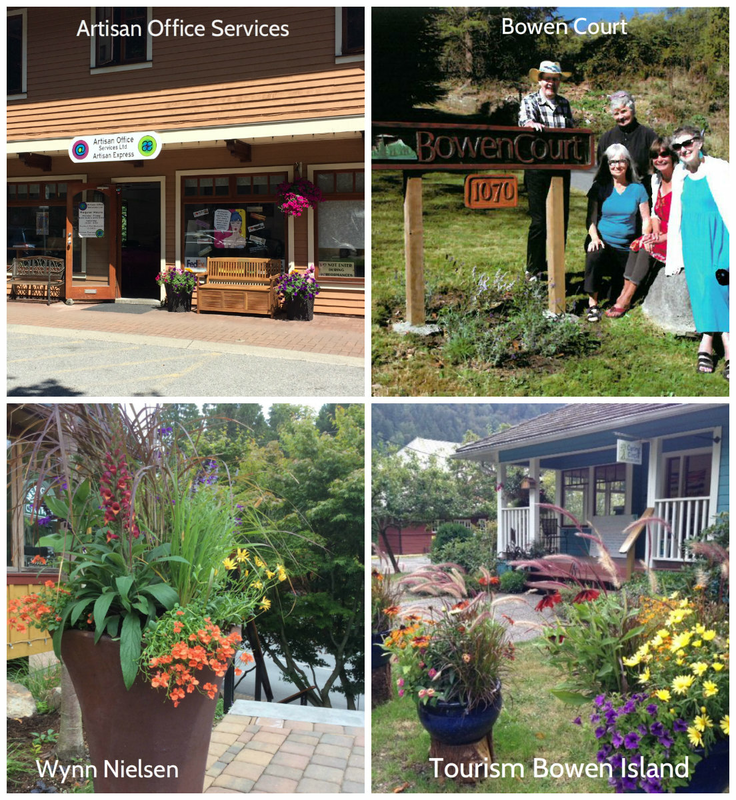 As a result of that evaluation, the Bowen in Bloom committee is pleased to announce that Bowen Island has been awarded three blooms! We would like to thank the volunteers who made this possible with the valuable contributions of their time, efforts and expertise. Special mention goes to Holly Graff, who was nominated for Community Champion. 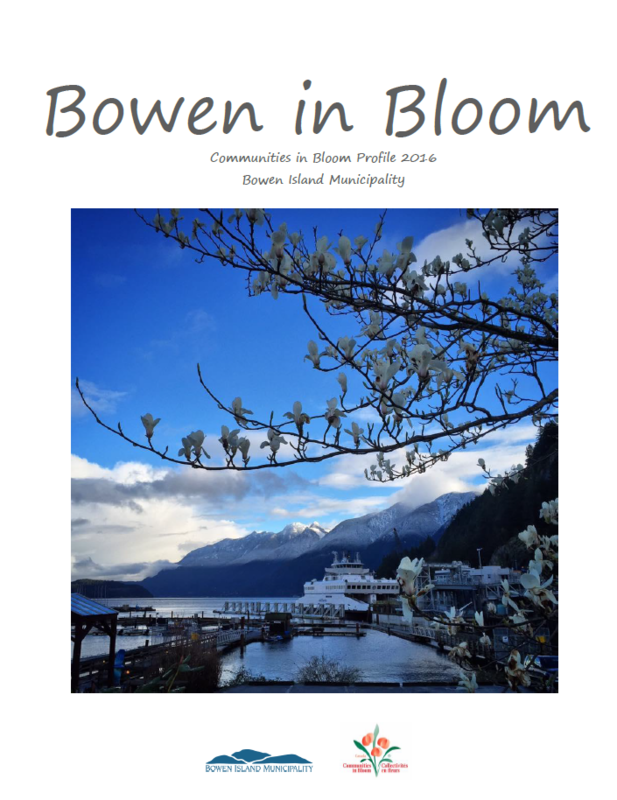 Read Bowen in Bloom, the Community Profile Book produced by the Communities in Bloom Committee for 2016. The Communities in Bloom Committee is a sub-committee of the Snug Cove Improvements Working Group and is composed of municipal staff, councillors and volunteer community members. Earlier this summer, Bowen Island Municipality sponsored a small grants program for summer beautification projects in order to stimulate community involvement for the Communities in Bloom judges’ tour. Open to any Bowen business, organization or individual, the matching grant competition resulted in four awards. Cherie Westmoreland of the Bowen Island Seniors Housing Cooperative (Bowen Court) received $500 to help develop a floral display to complement signage and improve the appearance of the property frontage. Wynn Nielsen was awarded $500 to add decorative pots and plants on the Village Square patio, working with the approval of the business property owners. Tourism Bowen Island’s Jody Lorenz requested $400 for decorative planters and flowers for Boulevard Cottage, a municipal building in Snug Cove. Margaret Miller of Artisan Office Services will use her $500 grant toward a new bench and planter in front of her Artisan Square shop. BIM is pleased to have supported these improvements and looks forward to the Innovation Grants becoming an annual program. How does Communities in Bloom benefit Bowen Island? Other communities have benefited in the following ways. As Bowen continues its participation in Communities in Bloom, we expect to realize some of the same benefits. Urban Forestry includes the efforts of the municipality, businesses, institutions and residents with regards to written policies, by-laws, standards for tree management (selection, planting, and maintenance), long and short-term management plans, tree replacement policies, pollinator friendly tree selection, tree inventory, and Integrated Pest Management (IPM), heritage, memorial and commemorative trees.